Has cleaning out your garage turned into the one chore that is a perpetual repeat on your to-do list? Do you drive into your driveway every rainy day and hope that miraculously your children have cleaned out the garage enough so that you can actually park you car in it? Has your garage turned into an extra storage space for everything that doesn't really have an official place? If you find yourself answering yes to any of these questions, don't feel completely overwhelmed. Help is just one work-filled day away! 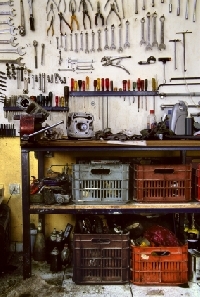 Webster's Dictionary defines the garage as the place to store or fix an automobile. But if your garage has instead turned into a war zone, then it is time for you to plan an organize-the-garage day with your family. First, ignore the collective groans you will get when you tell the family that you have a day of organizing fun planned. Organizing the garage does not sound like loads of fun when you first bring it up. But if you plan out the day beforehand and keep the mood lighthearted and fun, you will soon find that everyone can actually have a good time going through all of the treasures that can be found buried in the mess of your garage. On the day you have chosen to organize the garage, you will need to start out early and make sure that you have all of your purchased items ready to use. You will also want to have brooms, old rags, marking pens and any other cleaning items you think you may need already out and ready to go. You will not want to waste time during the day looking for these items or running to the store to get them. As you go through the items stored in the garage, you will want to throw away any items you have not used within the past year and those you know you will not need again. Make sure that you donate any useable items to a local charity. Most charities will even come to your home to pick these up. Organize the garage items you are keeping into the large and small plastic storage boxes, making sure you label them clearly with what you have stored in them. Most of the shelving available today is very easily hung on the walls of your garage and will be very handy for those small items you need regularly. This is especially true if you organize them into the small plastic storage containers and place those on the shelves within easy reach. By using the hooks to hang your tools on the walls of your garage, you will be able to find them easily and quickly when you need them. Your family will enjoy reminiscing about some of the old items you will discover as you organize the garage, and everyone will be amazed at how great it looks when the day is over. With a little bit of hard work and pre planning, you will be able to drive home on that next rainy day with a feeling of satisfaction that you now have a warm and dry place to park your car. Now just make sure that you also get the commitment of everyone in your family that you will keep the garage clean and organized from now on. As fun as it was to organize the garage as a family, I am sure that everyone will be able to find more exciting ways to fill the weekend!